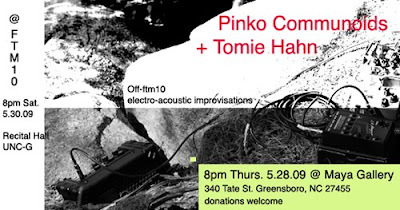 I will be performing with my trio Pinko Communoids in Greensboro, NC twice this week. Our first show (5.28) is a collaboration with Tomie Hahn, an incredible shakuhachi and movement improviser, also the author of Sensational Knowledge. Our second show will be at the Feminist Theory & Music 10 (FTM 10) meeting at UNC-Greensboro: 8pm, Saturday 5/30, Recital Hall. Come check out our performance if you just so happen to be in Greensboro! See the poster for details.